Fabien Nsengiyumva and family. Photo by K. Dale, Jhpiego. Three miles and two mountains away from the Mataba Health Center lives a family whose remote locale proves just how far health care workers in Rwanda will go to find a case of malaria. 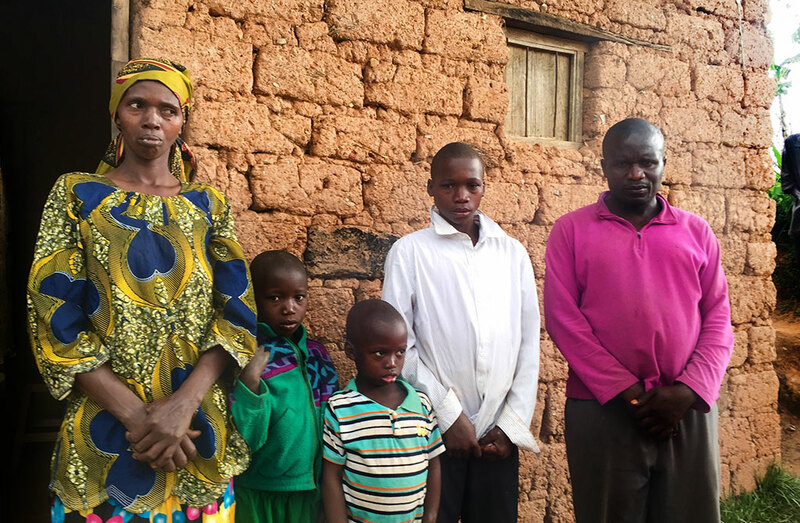 Sitting in his unlit house, a cow mooing in the background and rain pounding on the roof, Fabien Nsengiyumva told the story of how Rwanda’s national plan to eliminate malaria reached his isolated village in northern Rwanda and saved his family. As he spoke, the village community health worker, a nurse from the local health center and staff from the United States Agency for International Development’s flagship Maternal Child Survival Program (MCSP) listened attentively. They were delighted to hear that their work—which may be difficult and tiring—has so positively affected this father and his family. Nsengiyumva’s story began in August of last year. Feeling feverish, but lacking health insurance, he decided to self-medicate with drugs he bought at the pharmacy. His fever persisted and eventually, two of his children (ages 5 and 8) and his wife came down with fever. So did his neighbor. The neighbor, however, decided to travel the long distance to the Mataba Health Center; he was diagnosed with malaria and properly treated. His visit triggered the next steps in the pre-elimination effort—tracking down and treating any related cases of malaria. Pre-elimination strategies are used in countries like Rwanda where malaria has been brought under control, with the ultimate goal of eliminating all cases of malaria. With support from the United States President’s Malaria Initiative, MCSP has partnered with the government of Rwanda and the Rwandan Malaria and other Parasitic Disease Division to support malaria pre-elimination efforts in two of the eight epidemic-prone districts. The Mataba Health Center is located in one of the districts supported by MCSP. MCSP, led by Jhpiego, is working at the community level to strengthen health facilities in pre-elimination efforts and train providers on how to actively detect and treat malaria cases using rapid diagnostic tests. To date, MCSP has trained 195 health care providers—about half of the nurses, laboratory technicians and other health center staff in the two districts in Rwanda—on active surveillance strategies and use of pre-elimination tools, including proper documentation and use of geo-positioning systems for malaria case surveillance. These trained staff are tasked with educating their colleagues on the pre-elimination strategies and tools. When a client at a health facility in an MCSP-supported district is positively diagnosed with malaria, staff visit the client’s village or community within three days of the diagnosis. In the community, health care providers test household members and neighbors who live within 500 meters of every confirmed case. Community members who test positive for malaria are treated according to government protocols. Trained health care workers from the Mataba Health Center estimate that they see up to 20 malaria cases a week. They work tirelessly—climbing mountains, braving rain storms and navigating circuitous rural roads—to find anyone who may have come into contact with a person with a confirmed case of malaria. After locating Nsengiyumva and his family, for instance, the health care worker administered rapid diagnostic tests and, upon confirming a positive result, immediately treated them free of charge. Recognizing the essential role of the health center in finding and treating his family, Nsengiyumva has become an advocate of its role in the community. He has enrolled in the district medical insurance and has told others to do the same. With this medical insurance, neither he nor his neighbors will need to self-medicate if they become ill because they can seek care from professionals at the health center. Jhpiego’s Noella Umulisa also contributed to this article.